First impressions are everything in real estate. If you’ve ever fallen in love with a house from the moment you walked in the door, you know the power of a good first impression. Once a home buyer imagines cozying up to the fireplace or sipping coffee at the breakfast nook, the house is as good as sold. According to a joint study from The National Association of Realtors and Google, The Digital House Hunt: Consumer and Market Trends in Real Estate, 9 in 10 home buyers use the internet to conduct their primary research when searching for a new home. If the real estate photos of a home for sale are not up to par, those potential buyers will likely move on to the next listing. So, how do you create an impactful picture of your home’s potential right from the get-go, one that draws potential buyers in and makes them want to see and learn more? One way is with home staging. Imagine walking into a home and seeing the owner’s children smiling from within the frames on the walls and mementos from family vacations lining the fireplace mantel. While the home may be beautiful and appointed to the finest detail, the personal items make potential homeowners see it as someone else’s home, not their own. Home staging typically begins by decluttering rooms and removing personal items to create an inviting, neutral scheme. The objective is to help potential buyers see themselves living in the home. In fact, according to the National Association of Realtors, seventy-seven percent of buyers’ agents said staging a home made it easier for a buyer to visualize the property as a future home. A sense of belonging is a powerful emotion, and home staging can neutralize a decor in a way that helps evoke that feeling in a buyer. Cleaning, decluttering, and performing needed minor repairs are the first steps of successful home staging. When a home is clean and well-presented, home buyers will visualize their kids playing in the backyard, not eye cobwebs or untidy corners as they pass through the rooms. Instead of wondering how much time it will take to fix the broken outlet cover or leaky faucet, buyers will imagine making dinner in the kitchen. A clean, decluttered home is an instant draw and will keep potential homebuyers thinking about the house long after they walk out the door. 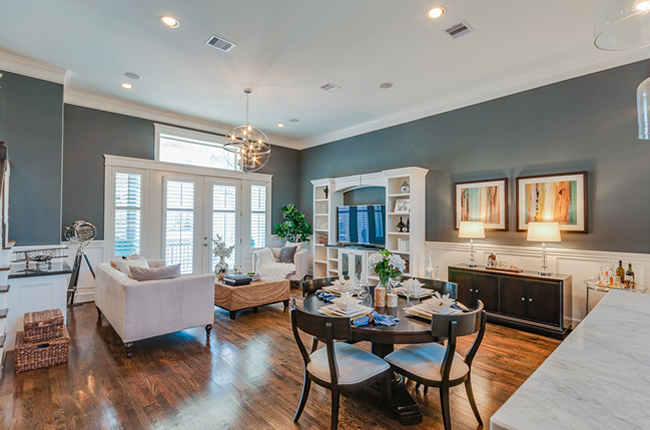 A study conducted by the Real Estate Staging Association (RESA) found that staged homes sell 73% faster than un-staged homes. A quicker sale means a better price for a home seller, because the longer a home stays on the market, the more the price tends to drift lower. In fact, in a survey, sellers agents that were members of the National Association of Realtors (NAR) found that the longer a home stays on the market, the lower the price drops. Interested buyers are also far more tempted to put forth a lowball offer if a house is sitting on the market. Chances are there’s another home for sale (or two or three) in your neighborhood. What’s to keep prospective buyers from walking down the street and falling in love with another house with a similar price point? Not only can home staging set your home apart, but buyers are more inclined to pay more for a beautifully staged home. In a survey by the NAR, approximately one-third of buyer’s agents said potential home buyers are willing to spend 1% to 5% more on the home when it is staged. Home staging is really an investment with great returns. In fact, Home Gain conducted a survey and found that staging can yield up to 556% returns. After decluttering, a home stager will remove some furniture and personal items to neutralize the feel of the space. As items are removed during the home staging process, there is no better time to start packing in advance of moving day. Often, the best way to pack personal items is to do it yourself. What’s more, a little bit of packing can help home sellers detach from the home and mitigate some of the emotions that go along with moving day. If you have questions about home staging or the home selling process, call me, Nancy Lederman, (973) 444-9388 or email nancylederman@kw.com . I would love to assist you.